Washington institutions esteemed for their independent scholarship don’t disclose donations from corporations and foreign governments. Editor’s Note: We received a letter from the Center for American Progress on May 24, 2013 objecting to aspects of Ken Silverstein’s article. In the interest of debate, we publish that letter at the end of this article, along with Silverstein’s response. The Center for American Progress, Washington’s leading liberal think tank, has been a big backer of the Energy Department’s $25 billion loan guarantee program for renewable energy projects. CAP has specifically praised First Solar, a firm that received $3.73 billion under the program, and its Antelope Valley project in California. house law and lobbying firm Akin Gump, who “provides strategic counseling on a range of legal and policy issues” for corporations—was on First Solar’s board until April 2012 while also sitting on the board of CAP, where he remains a member, according to the group’s latest tax filing. CAP is a strong proponent of alternative energy, so there’s no reason to doubt the sincerity of its advocacy. But the fact that CAP has received financial support from First Solar while touting its virtues to Washington policy-makers points to a conflict of interest that, critics argue, ought to be disclosed to the public. CAP’s promotion of the company’s interests has supplemented First Solar’s aggressive Washington lobbying efforts, on which it spent more than $800,000 during 2011 and 2012. When Newt Gingrich was running for president, The Washington Post ran a story about the Center for Health Transformation, which it described as his “hybrid” single-issue think tank. The center, which subsequently went bankrupt and was bought by WellStar, published reports and advocated on behalf of donors—including lobbyists and industry groups that donated millions to support its work—in addition to offering perks like “direct Newt interaction.” While the center did disclose some of its donors, it didn’t reveal how much money they had contributed. It was an interesting story, but it obscured a key point: Newt’s “hybrid” was a particularly straightforward form of pay-to-play, but its basic features are common at Washington think tanks. Like Newt’s Center for Health Transformation, many lure big donors with a package of benefits, including personalized policy briefings, the right to directly underwrite and shape research projects, and general support for the donor’s political needs. Because most think tanks don’t fully disclose their donors, it’s not always easy to see what sort of benefits money can buy. But during Chuck Hagel’s confirmation hearings, the Atlantic Council, where he’d been chairman before moving to the Pentagon, released a list of its foreign donors. One of them turned out to be the oil-rich government of Kazakhstan, headed by dictator Nursultan Nazarbayev. Last year, the council hosted a conference on Kazakhstan that was paid for by the Nazarbayev regime and Chevron, which has vast oil interests in the country and is also a major donor to the council. Keynote speakers included Kazakhstan’s former ambassador to the United States and Kenneth Derr, a former Chevron CEO and now Kazakhstan’s honorary consul in San Francisco. John Podesta, former chief of staff to President Bill Clinton and the head of Obama’s first transition team, founded the Center for American Progress in 2003. Last year, Podesta stepped down as CAP’s president—he remains its chair and counselor—and was replaced by Neera Tanden, who served in both the Obama and Clinton administrations. Former Virginia Congressman Tom Perriello heads the CAP Action Fund, an advocacy unit, which operates out of the same offices and shares personnel. CAP has emerged as perhaps the most influential of all think tanks during the Obama era, and there’s been a rapidly revolving door between it and the administration. CAP is also among the most secretive of all think tanks concerning its donors. Most major think tanks prepare an annual report containing at least some financial and donor information and make it available on their websites. According to CAP spokeswoman Andrea Purse, the center doesn’t even publish one. Purse told me that CAP “follows all financial disclosure requirements with regard to donors…. We don’t use corporate funds to pay for research or reports.” But she flatly refused to discuss specific donors or to provide an on-the-record explanation for why CAP won’t disclose them. After growing rapidly in its first few years, tax records show, CAP’s total assets fell in 2006 for the first time, from $23.6 million to $20.4 million. Assets started growing again in 2007 when CAP founded the Business Alliance, a membership rewards program for corporate contributors, and then exploded when Obama was elected in 2008. According to its most recent nonprofit tax filing, CAP’s total assets now top $44 million, and its Action Fund treasury holds $6 million more. CAP doesn’t publicly disclose the members of its Business Alliance, but I obtained multiple internal lists from 2011 showing that dozens of major corporations had joined. The lists were prepared by Chris Belisle, who at the time served as the alliance’s senior manager after having been recruited from his prior position as manager of corporate relations at the US Chamber of Commerce. According to these lists, CAP’s donors included Comcast, Walmart, General Motors, Pacific Gas and Electric, General Electric, Boeing and Lockheed. Though it doesn’t appear on the lists, the University of Phoenix was also a donor. Incidentally, Scott Lilly, a Hill veteran who joined CAP in 2004 as a senior fellow covering national security, simultaneously served as a registered lobbyist for Lockheed between 2005 and 2011. Rudy deLeon, CAP’s senior vice president for national security and international policy, was a Boeing executive and directed the company’s lobbying operations between 2001 and 2006, before joining the think tank the following year. Several CAP insiders, who asked to speak off the record, told me that when Podesta left, there was a fear that contributions would dry up. Raising money had always been important, they said, but Tanden ratcheted up the efforts to openly court donors, which has impacted CAP’s work. Staffers were very clearly instructed to check with the think tank’s development team before writing anything that might upset contributors, I was told. I obtained a March 2012 e-mail from Belisle to Podesta and CAP’s communications and legal teams, which was also copied to Tanden. The e-mail noted a Think Progress item featuring a New York Times op-ed by former Goldman Sachs executive Greg Smith, who called the company’s environment “toxic and destructive.” At the time, the firm was under heavy fire for deceiving investors and for its larger role in driving the speculation in toxic securities that unwound the economy. Belisle said he was “flagging” the item for Tanden since she had recently met with Michael Paese, director of Goldman’s Washington lobbying office. Two sources told me that Goldman Sachs subsequently became a donor. Purse and Paese declined comment. 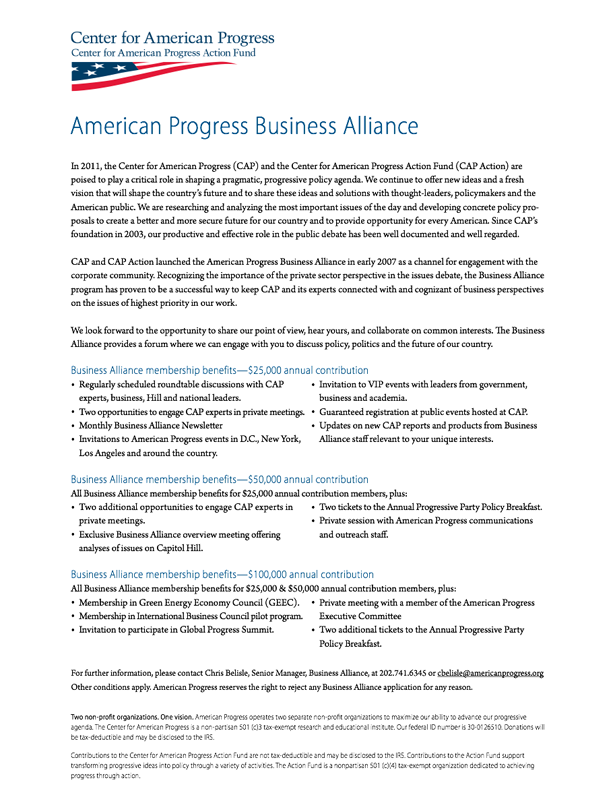 Foreign governments and business entities can also join the Business Alliance, whose membership list includes the Taipei Economic and Cultural Representative Office—which functions as Taiwan’s embassy in Washington and retains many lobbyists, including former Oklahoma Republican Senator Don Nickles and former Missouri Democratic Representative Richard Gephardt—and the Confederation of Businessmen and Industrialists of Turkey (TUSKON). In 2010, CAP issued a report, “Ties That Bind: U.S.-Taiwan Relations and Peace and Prosperity in East Asia,” which warned that the partnership between the two countries had stagnated and suggested that the United States maintain arms sales to Taiwan, increase economic and diplomatic cooperation, and otherwise “seek ways to deepen their relationship.” That same year, CAP’s Scott Lilly gave an address at the American Institute in Taiwan, in which he hailed the ties between the two nations as “one of the more important bilateral relationships in the world” before calling for additional arms sales to Taiwan. Lockheed, whom Lilly lobbied for at the time, is a leading arms merchant to Taiwan. With help from TUSKON, CAP also makes an annual fact-finding trip to Turkey, the most recent being in February of this year. The CAP delegation met with US Ambassador Francis Ricciardone and senior Turkish government officials. A former CAP staffer told me that TUSKON had “amazing access” and “could call anyone in the government and get us a meeting or interview.” As a result of the Turkish group’s support, CAP was “totally in the tank for them,” this source said. CAP also presses for closer ties between the US and Turkish governments, just as Ankara’s lobbyists do. Last year, CAP hosted an event featuring Commerce Secretary John Bryson, who spoke on his “vision for deepening even further the US-Turkish commercial relationship.” Two years earlier, Podesta gave the keynote address at a TUSKON conference in Istanbul. In his speech—titled “The Unique Importance of the Turkish-American Relationship”—he praised CAP senior fellow Michael Werz for his work on “strengthening the US-Turkey relationship.” He also pointedly noted that Werz’s predecessor as CAP’s Turkey expert, Spencer Boyer, had left the think tank to become the Obama administration’s deputy assistant secretary for European affairs. “Our policy work is independent and driven by solutions that we believe will create a more equitable and just country,” Purse told me. It would be easier to believe that statement, let alone evaluate it, if CAP was more transparent about its funding. The same holds true for think tanks in general—which, unlike other powerful Washington institutions, have the luxury of telling the public and policy-makers only what they choose about their funders. Editor’s Note: We received a letter from the Center for American Progress on May 24, 2013, objecting to aspects of Ken Silverstein’s article. In the interest of debate, we publish that letter below, along with Silverstein’s response. Core to liberal thought is the idea that evidence should come first and conclusions should follow. 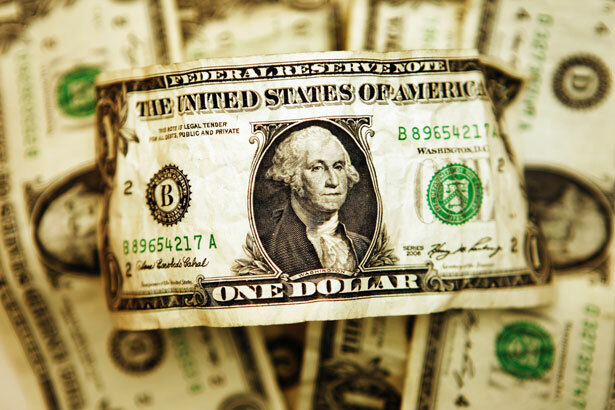 Ken Silverstein’s recent article, The Secret Donors Behind the Center for American Progress and Other Think Tanks, insinuates a lot but the facts tell a different story. The inference at the heart of the author’s story is that corporate donations shape or drive the content of CAP and CAP Action. That assertion is baseless and completely false. The most central case to the author’s argument relies on a junior staffer “flagging” a hard-hitting piece we did on Goldman Sachs. The author then fails to cite the fact that the leadership of the organization raised no concerns—indeed the leadership of the organization pushed for additional coverage—and the original draft appeared verbatim and remains publicly available; along with more than two dozen other pieces of our reporting that are highly critical of Goldman Sachs. All that was required was a simple search on ThinkProgress. The author also argues that CAP takes funds from Turkish interests, including a quote from an anonymous source that “As a result of the Turkish group’s support, CAP was “totally in the tank for them.” Again, the author’s insinuation is refuted by CAP’s body of work. In fact, just days before the Turkish Prime Minister recently visited Washington, CAP published a piece critical of the Turkish government, Freedom of the Press and Expression in Turkey. The author goes even further insinuating that CAP’s growth over the year is attributable to our creation of our Business Alliance in 2007 and corporate donations. As Huffington Post wrote in March, philanthropic giving is what is responsible for our growth. The fact of the matter is only 6 percent of our funding in 2012 came from corporate donors, and it has never reached double digits. These are the facts. Facts that undermine the preconceived conclusion drawn by the author. We are fiercely and proudly independent in our work and strongly refute any inference to the contrary. We expect more from The Nation, and we eagerly encourage any reader to look directly at the substance of our work on corporate accountability and financial sector reform, clean energy, campaign finance reform, defense cuts, and progressive tax reform to judge for themselves. CAP was given plenty of time to reply before the story was published and chose not to. Now it has sent a letter that misrepresents what I wrote and hence shoots down arguments I didn’t make. There is evidence that CAP’s agenda has been influenced by its decision to take corporate money, but that is not the central “inference at the heart of the story.” The main point of the story is that CAP takes money from corporate donors without disclosing it, which is not an inference but a fact. Another fact is that in doing so, CAP sometimes acts as an undisclosed lobbyist for its donors. As described in the story, First Solar gave money to CAP and CAP’s staff advocated for First Solar before Congress and in articles on CAP’s website without disclosing that pertinent piece of information. People should read my story and decide for themselves who is telling the truth.